First time ever the song is played live by the band. Synchronized multi-camera edit. Video: FitH, William McCarthy, Daniel Mitchinson, Nick Ciardiello, Ashley Rutter, treycarter91, sd nop. Audio: yupsure2. New featured video with Still Breathing, from the new album Revolution Radio, available October 7, 2016. Enjoy exclusive pictures from the outdoor gig yesterday at the Lancashire County Cricket Club in Manchester, from our photographer Danielle Millea, on this Flickr set. More photos coming soon: we'll cover the two next stadium shows, in London Wembley on June 19, and at the Parc des Princes in Paris on June 26. Added two new songs from the Canal+ 2009 concert, that are now featured above. Our Green Day Links page is also totally updated. While the band members themselves aren't big fans of the iPhone - both Billie Joe and Tré Cool post on the official Twitter account with a BlackBerry - I know and have seen at concerts many Green Day fans with an iPhone or an iPod Touch. 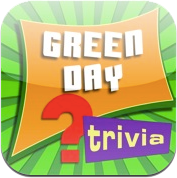 Already searched for Green Day apps in the iTunes Store? I did but haven't found anything transcendental so far. Some bands have pretty nice official apps, like Nine Inch Nails or Dave Matthews Band, where you can view exclusive multimedia content, or find and interact with other fans of the band. 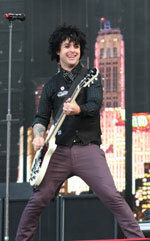 Green Day doesn't have such an app (yet?). 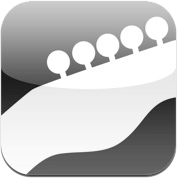 I still found very unofficial Green Day related apps, and review two of them here. Since the day this site has a YouTube channel - two years ago - I discovered my Green Day videos there receive more hits than the ones to download here. So I decided to take advantage of the YouTube platform, and get some work done on my channel. I'm happy to annonce it's now totally revamped with more content, subtitles with lyrics, subtitles for non-English interviews, videos sorted into playlists, and more. Check it out here. Uploaded today in the Videos section: See The Light live in Berlin, Germany, a few days before the 21st Century Breakdown album release. This is a rare live song, as the band did not play it during the World Tour that followed. The Brazilian fan community wants Green Day back in Brazil - last time was in 1998! - and put out this rather funny 6 min collaborative video, showing themselves sing Green Day songs. Secret Pinhead Gunpowder show tonight at 924 Gilman Street in Berkeley, CA. This was just announced by Billie Joe. Have fun if you can go, and send us your videos. 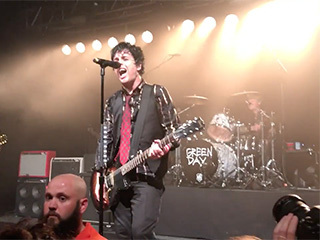 In site news, I uploaded a new version of our 21st Century Breakdown (Live in Paris) video, with a much better sound and a multi-camera mix. Congratulations to Green Day for picking a Grammy last Sunday for Best Rock Album with 21st Century Breakdown, in competition with - among others - no less than AC/DC and U2. The band played 21 Guns during the ceremony with the Cast of the American Idiot musical. Watch a 30 sec preview above (and buy the full song on iTunes).